Our collaborative practice began in 1997. Since then we've used video, audio, live action, neon and other media, to make a variety of art works. 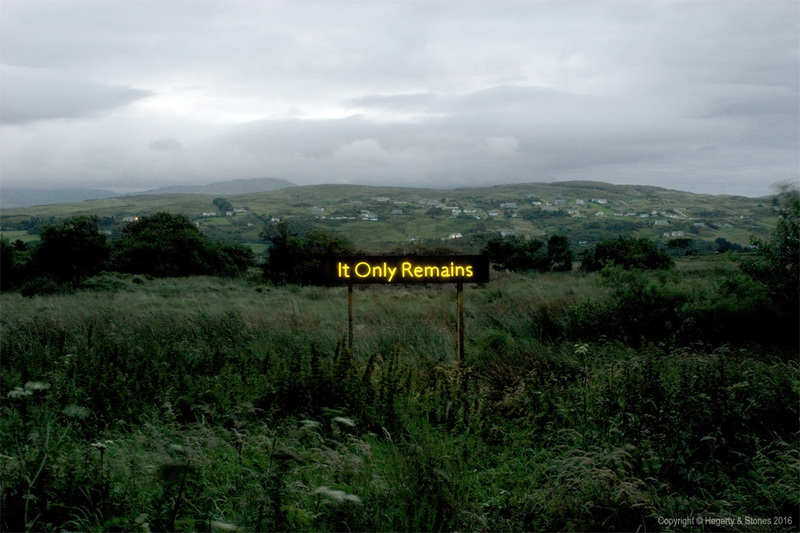 Whether they are shown in gallery or public spaces, these joint works usually have a site-specific aspect. 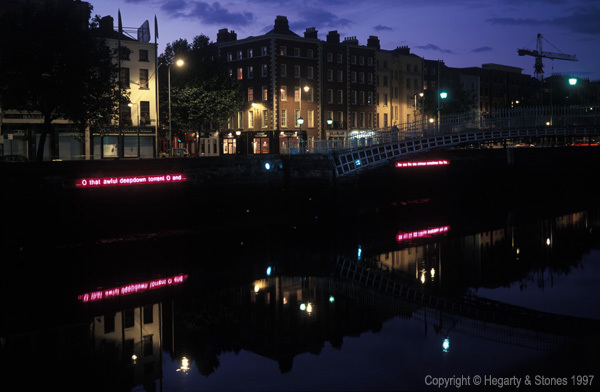 For Dublin (Irish Museum of Modern Art /Nissan Art Project, 1997) was a multi-site, temporary neon work in Dublin city centre. It was intended as both an aesthetic pleasure, and an invocation of two ideas closely associated with James Joyce's Ulysses: psychogeography and gendered speech. For Dublin has been widely cited in academic writing about cityscape, commemoration, and Irishness, and has even appeared in contemporary literary fiction. Eight manifestations of James Joyce's Molly Bloom in Dublin city centre. 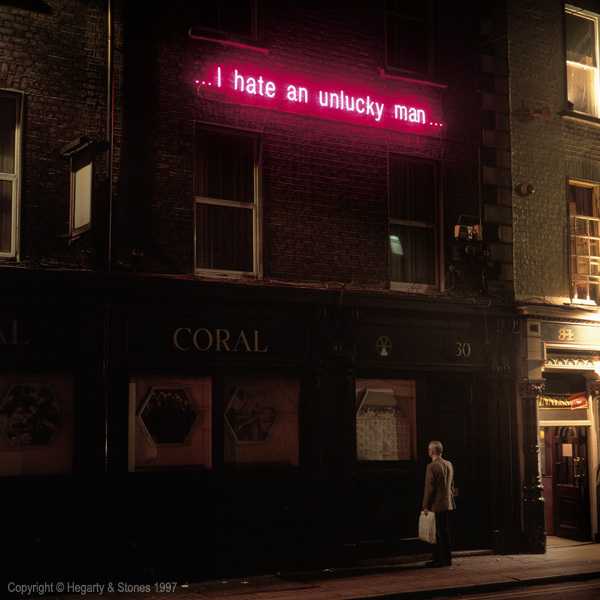 Temporary public art work: nine neon texts in eight sites. Indoor video projection (recorded eight-hour performance for station platform, mixed with live video feed of the performance site). We often look for ways in which perceptions of a given site might be unsettled through aesthetic manipulations or time-shifts; presenting in the site an altered version of what normally goes on there. In Seemingly So, Evidently Not, Apparently Then (Sheffield 1998) a continuous, eight-hour performance was intermixed with a live surveillance feed from railway station platform. 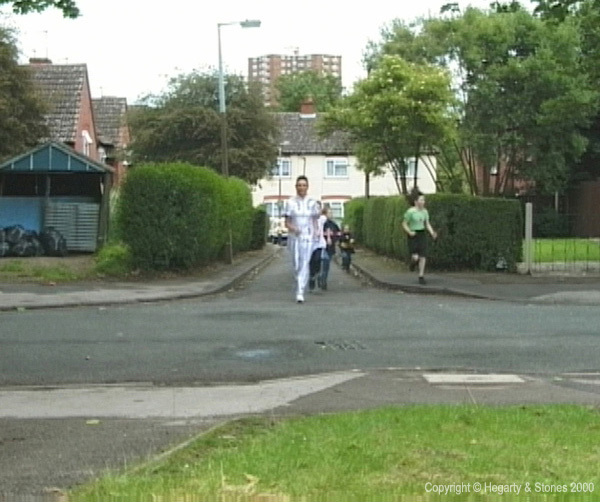 In Orienteer (A-Z, Dawn to Dusk) (Birmingham, 2000) a female runner makes an impossible traverse of Birmingham. Single screen video with stereo audio. 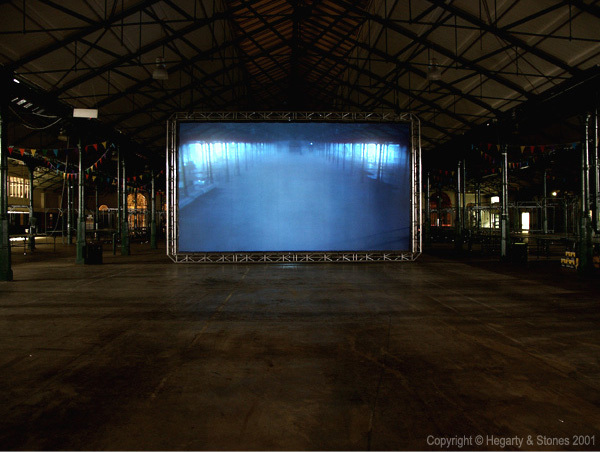 For Overnight Sensation (Belfast,2001) and Extra (Bradford, 2002/3) we used video post-production and live mixing techniques to create subtly-altered versions of the everyday life of a market hall and a city square respectively. Single screen video projection with audio, for a covered market. Single-screen video with 4-channel surround-audio. 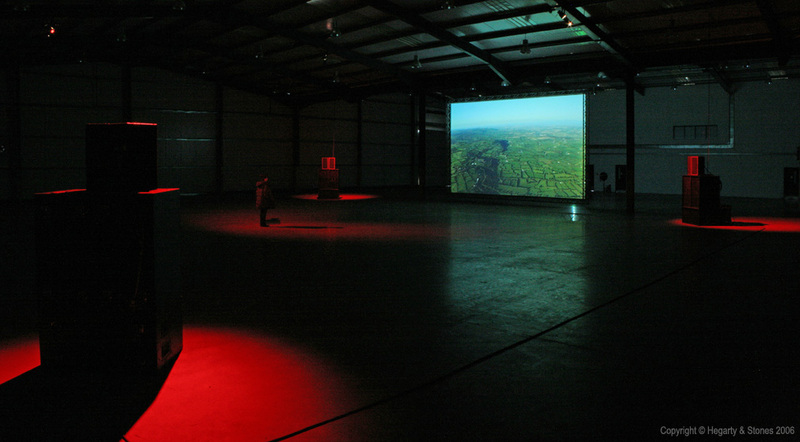 In 2006 we were commissioned to make the video/audio work Ex Machina in Carlow, Ireland. The piece is an artistic response to the remains of the Carlow Sugar Factory, which was being asset-stripped when we gained access to it. Using helicopter, crane and wire shots we created an unswerving linear trajectory that starts in the sky, penetrates the factory, and drops down, level by level, into its depths. There's a brief, quasi-magical respite, and then the camera is expelled, back along its entry route. 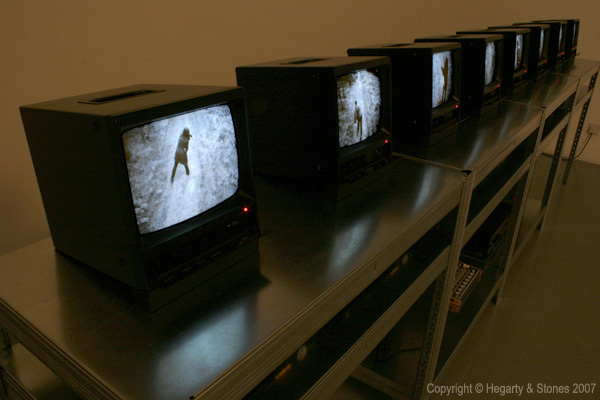 Tactically Yours (Kilkenny 2007) is a suite of four video installations. In three of these we are both seen on multiple CCTV video screens practicing the tactics of the street protestor, within a sectorised conifer plantation. 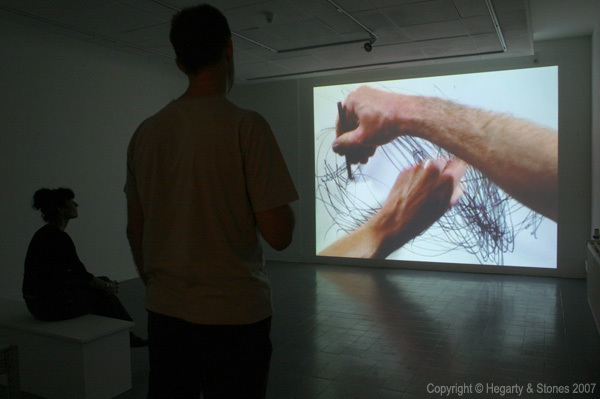 The fourth part is a single projection, in which Frances's left hand and Andrew's right undertake a series of rapid drawing exercises: actions which are alternately co-operative and combative. Four linked installations with: video projection, CCTV monitors, galvanized steel shelving, visible A/V apparatus and cabling. In 2015 we began work on a project with the working title The Land That. This is intended as a suite of interconnected moving-image installations for multiple rooms, the whole having performative, film-genre, and site-specific aspects. The Land That draws on high-definition video and audio recordings acquired over several months in Donegal, on ten acres of land owned by the Hegarty family since the early 1800s. The notion of "the land" is taken as a contested one, in which multiple investments (familial and historical, political and ecological) vie for attention. Frances Hegarty was born in Teelin, Co. Donegal, Ireland, later emigrating to Scotland. She now divides her time between Sheffield, England and Co. Donegal. 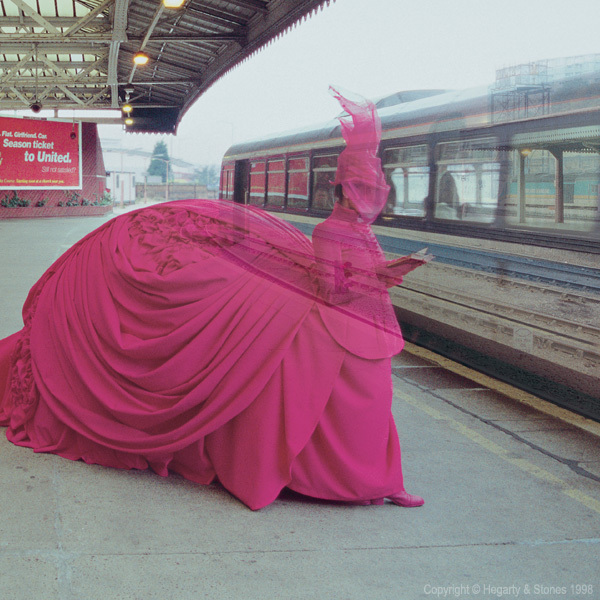 Her artistic work spans four decades: at times concerned with received ideas of cultural and national identity, with emigration, with the female body and mortality. She works with video, audio, photographs, drawing and installation, exhibiting worldwide. As a lecturer based in Sheffield she advocated strongly for performance and time-based art from the late 1970s onwards. She remains Emeritus Professor of Fine Art at Sheffield Hallam University, and is a member of Aosdana in Ireland. Her individual work is archived at www.franceshegarty.com. Andrew Stones was born in Sheffield, England. He has worked as an artist since 1984, exhibiting widely. His video, audio and mixed-media installations often explore the coexistence of artistic and scientific thinking, via the cultural manifestations of each broad field. His many awards and commissions include a NESTA Fellowship (2001-04) which enabled video shoots at major science establishments, including Arecibo Radio Observatory (Puerto Rico), and CERN (Switzerland/France). He holds a PhD (Slade School of Art/UCL 2011) and writes on subjects related to the core concerns of his work. His individual work is archived at www.andrewstones.com.